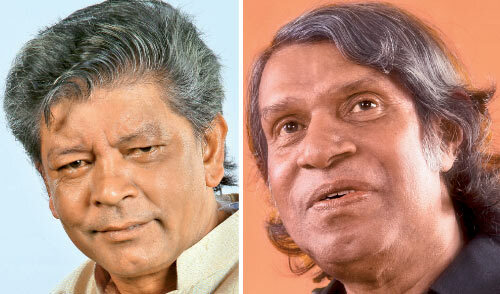 Two veteran musicians who have made their mark in the Sri Lankan music field H M Jayawardena and Thissasiri Perera were felicitated recently at Nelum Pokuna named as Miyasi Theerthaya. A gamut of artistes sang their hearts out in the evening songs H M and Thissasiri created for them. Among these artistes were Prof Sanath Nandasiri, T M Jayaratne, Amarasiri Peiris, Bandara Athauda, Edward Jayakody, Divulgane, Kasun Kalhara, W D Ariyasinghe, Sandhya Bulathsinhala, Charitha Priyadharshini and Shashika Nisansala. Mahinda Bandara directed music while Pandit Amaradeva and Nanda Malini too added colour to the occasion. H M - Thissa felicitation committee comprised with Musicians Navaratne Gamage, Lal Ananda Abeydheera, Ajith Dharshana Jayaweera were behind the scene supporting the endeavour. H M Jayawardene is a musician whose prowess in music composing was kept on par with maestro Premasiri Khemadasa at times. In the decade of 70 when a certain song was aired over radio in a silent night one would wonder the music composer and melody maker of the song was Khemadsa. But he would later find H M Jayawardene as the creator of the song. H M was thus known for his haunting melodies and music compositions. Thissasiri Perera is no exception. His music composing talent is very well known by people in the sphere. "A music type was created by the duo H M and Thissasiri that is in line with the folk music genre in the country. While H M hitting the limelight Tissasiri confining to his shell did his marvels silently over the decades", said Lal Ananda Abeydheera. Navaratne Gamage said Thissasiri's knowledge in music composing is extraordinary. "He gave me strength and courage to tread on the music path when I came from the drama field. He gave me great advises and tips to sustain my abilities and progress in the field" said Gamage. "Miyasi Theerthaya felicitation program could be treated as rectifying a national responsibility that has been neglected for a long period", said literary whiz kid and poet Ratnasiri Wijesinghe. Good deed by fellow artistes.This would have made both the veterans to live rest of their lives with happiness & satisfaction.